Bring your family and friends out for an old fashioned ‘sock-hop’ style winter formal dance. 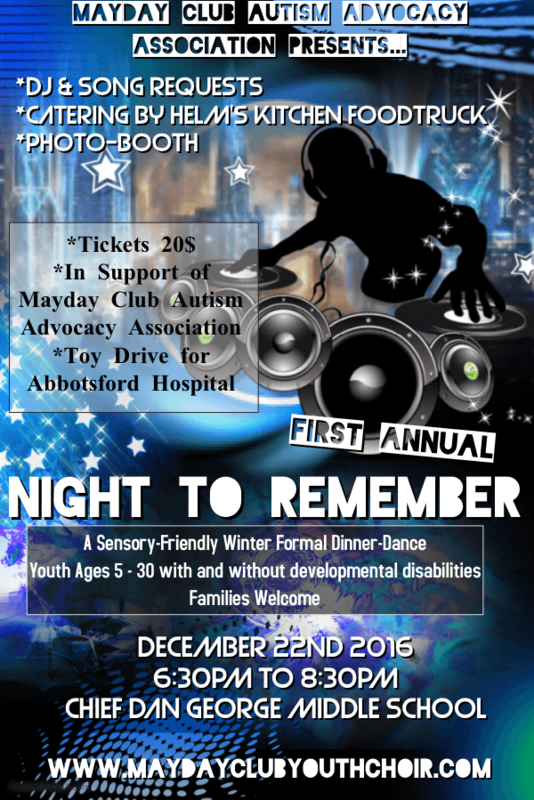 The Night to Remember Dance is sponsored by the Mayday Club Autism Advocacy Association, and is open to individuals with or without developmental or physical disability, ages 5 to 30. Families welcome (all ages, if accompanying a guest within our age range). There are just 200 tickets and are selling out quickly; Purchase a ticket now! Tickets may be available for purchase at the door. Features of the evening include full DJ Service, Song Requests, and Shout-Outs, Photo-Booth and Photo Contests, Dance Contests, Prizes, Father-Daughter Dance, Great Food Available for Purchase, Sundae Bar, Quiet Area Available in school multi-purpose room. Event catered by Helm’s Kitchen Food Truck. This entry was posted on December 22, 2016 by ACT.